The Virginia Institute of Marine Science has announced the winners of its 16th annual photo contest, an in-house competition held to recognize and honor the most captivating images taken by VIMS faculty, students, and staff during their scientific work in the field and laboratory. The first-place winner for 2015 is PhD student Josh Stone, for his stunning close-up a comb jelly’s iridescent cilia. Stone took the picture in the lab at VIMS as part of his doctoral research into the ecology of jellyfish and other gelatinous zooplankton in Chesapeake Bay. He says comb jellies get their name from the rows of cilia that run along their barrel-shaped bodies—structures that look like the teeth of a comb. 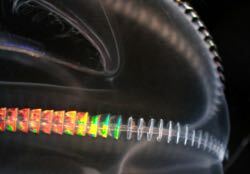 “These cilia easily refract light and cause pulsing rainbows to travel along the body,” says Stone. He took the photo using an Olympus DP73 Digital Microscope Camera. 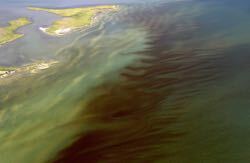 Taking second-place was professor Wolfgang Vogelbein, for his aerial image of an algal bloom in the York River. He took the photo on August 17th from 1,000 feet above the tip of the Guinea marshes during an over-flight facilitated by the Virginia Marine Resources Commission. Field samples show the bloom was dominated by Alexandrium monilatum, an algal species known to release toxins harmful to other marine life, particularly larval shellfish and finfish. Both Vogelbein and fellow VIMS professor Kim Reece are members of Virginia’s Harmful Algal Bloom Task Force. 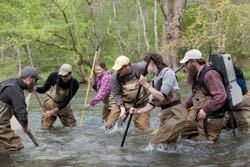 The third-place winner is professor Kevin Weng for his field shot of VIMS students and faculty sampling fish in a western Virginia river during the annual Roanoke Roundup. The event, now in its 46th year, gives graduate students at VIMS a unique opportunity to see evolution in action as they collect and study the broad diversity of freshwater fishes that inhabit the isolated valley streams of the Appalachian Mountains. Stein says she "greatly appreciates the efforts of those who submit their photos to our contest," and notes that VIMS uses photo-content entries to help illustrate its print publications, outreach materials, and website. This year’s contest garnered 109 entries. VIMS Dean and Director John Wells says he enjoys the photos for their "engaging depiction of the wide diversity of research activities pursued by VIMS scientists in Chesapeake Bay and around the world."